(Nanowerk News) Single atoms or molecules imprisoned by laser light in a doughnut-shaped metal cage could unlock the key to advanced storage devices, computers and high-resolution instruments. 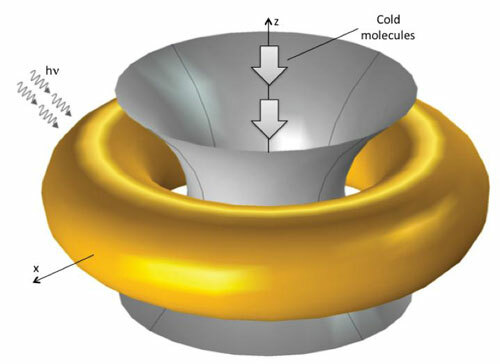 In a paper published in Physical Review A ("Toroidal nanotraps for cold polar molecules"), a team composed of Ali Passian of the Department of Energy's Oak Ridge National Laboratory and Marouane Salhi and George Siopsis of the University of Tennessee describes conceptually how physicists may be able to exploit a molecule's energy to advance a number of fields. "A single molecule has many degrees of freedom, or ways of expressing its energy and dynamics, including vibrations, rotations and translations," Passian said. "For years, physicists have searched for ways to take advantage of these molecular states, including how they could be used in high-precision instruments or as an information storage device for applications such as quantum computing." Catching a molecule with minimal disturbance is not an easy task, considering its size - about a billionth of a meter - but this paper proposes a method that may overcome that obstacle. When interacting with laser light, the ring toroidal nanostructure - sort of like a doughnut shrunk a million times -- can trap the slower molecules at its center. This happens as the nano-trap, which can be made of gold using conventional nanofabrication techniques, creates a highly localized force field surrounding the molecules. The team envisions using scanning probe microscopy techniques to access individual nano-traps that would be part of an array. "The scanning probe microscope offers a great deal of maneuverability at the nanoscale in terms of measuring extremely small forces," Passian said. "This is a capability that will undoubtedly be useful for future trapping experiments. "Once trapped, we can interrogate the molecules for their spectroscopic and electromagnetic properties and study them in isolation without disturbance from the neighboring molecules." "If successful, these experiments could help enable information storage and processing devices that greatly exceed what we have today, thus bringing us closer to the realization of quantum computers," Passian said. Salhi envisions a similar future, saying, "These advances are unveiling the beauty of the optical response for many complex geometries and opening the door to handcrafting the electromagnetic environment. We envision applications not only for trapping but also in designing new optically active devices."